Wednesday’s citywide flooding may have had a few people wondering if someone nearby was building an ark. Turns out that the flood quickly receded, but in its wake it had left a large and nasty cleanup for many households. Two inches of rain fell in less than hour, overwhelming the city’s sewer lines. A number of people reported that sewage water had backed up in their basements. Some reported as much as four feet of water. Marge Czarnik was walking from her Trowbridge St. home with a bottle of bleach in her hand. She was going to her mother’s house to disinfect the basement, which had been flooded. “A lot of bleach will be sold today,” she said. Some streets also became impassable, especially under viaducts on Jos. Campau and Holbrook. 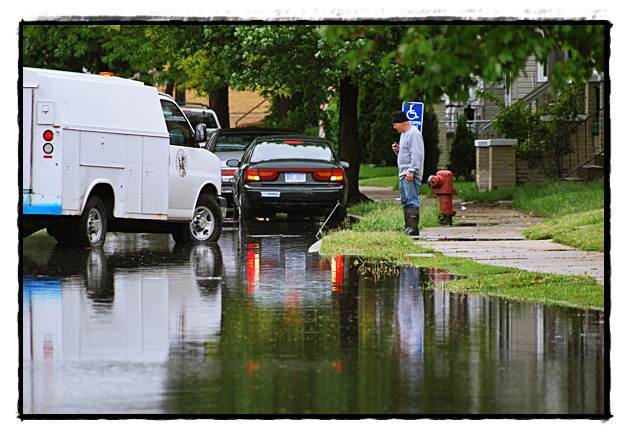 DPW crews were sent to the worst spots to remove sewer grates in order to allow faster drainage. The ongoing flooding problem has ended up in court where a group of residents are suing the city for past damages. Suing the city of hamtramck for flooded basements is just pointless, wastes your money and the city’s and makes our attorney very happy. over the last week i saw stories about flooded basements throughout the metro detroit area and many of those cities have updated and modern systems newer than ours. I guess what i’m saying here is, much like Mr z put it, people who sue the city are suing themselves, because how do you think the city comes up with money to pay frivilous lawsuits? thats right they pull money from programs like public safety and intrastructure repair! every dollar you win from the city is taken from us, the taxpayers, so next time your neighbor talks about suing the city remind him that he is suing you!